This France river cruise adventure begins in style with two overnights in Paris-one of the world’s most romantic and vibrant cities! The City of Light has Notre Dame Cathedral, the Eiffel Tower, and the Louvre Museum with its elegant glass pyramid contrasting its ancient architecture. A guided city tour will show you all the must-see sights before you travel via high-speed train from Paris to Dijon. You’ll tour one of France’s architectural and home of Van der Weyden’s “The Last Judgement” gracing Beaune’s Hotel-Dieu Charity Hospital-built in 1443. You’ll sail to the Chardonnay wine region of Macon, enjoying cheese tasting on board. 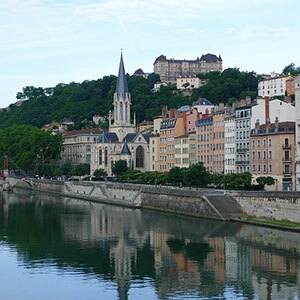 You’ll visit Lyon, a showcase of medieval and Renaissance architecture, as well as France’s gastronomic capital. Lyon offers wonderful sights, including the popular Place des Terreaux with its famous fountain seen on postcards, and world-famous cuisine to discover on a guided culinary walk.